The release of chemical agents can cause loss of life and result in major incidents. Chemical agent-related major incidents require a modified response by emergency services due to the chemicals’ transmissibility, lethality, latency and persistence. In general, modifications to casualty flow, triage and treatment are made to reduce transmissibility, and lethality of chemical hazards. 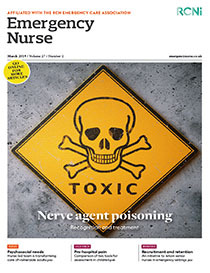 This article, the second of a two-part series on nerve agents, describes the adapted response and explains how emergency nurses must be familiar with principles of care including incident and casualty management.